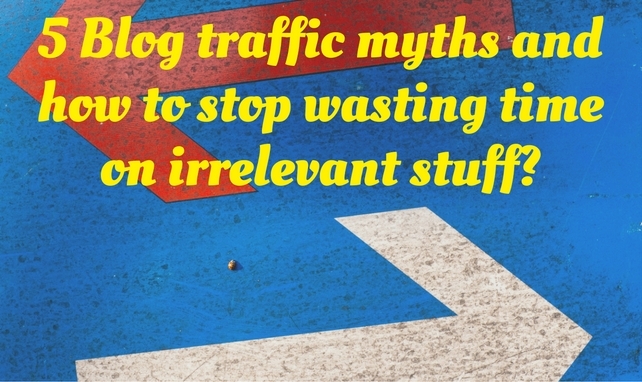 5 Blog traffic myths and how to stop wasting time on irrelevant stuff? Blog traffic is one thing that denotes how much appreciation a blog gets from the audience. Out of the hundreds of thousands of blogs available on the web, very few blogs get noticed and become popular and ultimately, will have a very huge following. How to measure the success of any blog? As everyone thinks of, the answer is blog traffic. The higher the blog traffic is, the higher the popularity of a blog, in general. But this need not be always true, because there is also the kind of blog traffic that just doesn’t convert. Nevertheless, for this post, let us assume that if we manage to get enough blog traffic, then we also can manage to make that traffic to convert. However, there are many myths that could mislead you when you look at the channels that bring blog traffic. Let us check out the inconsistencies in this regard. Is your blog traffic relevant? Undoubtedly, the traffic to a blog is a great encouragement to the writer(s) and the blog owner. Remember though, beginner bloggers may not get the expected numbers in the initial weeks or months after the launch of a blog. This does not imply that the blog has failed. It does take a while (a few weeks) for any blog to take off from the ground. As your blog evolves over a period of time, consistency plays vital role in deciding the growth of a niche blog. A growing blog’s success is indicated through a steadily growing blog traffic stats curve rather than spikes – very high numbers in one day and no visitor at all on the other day. Your blog traffic growth can be consistent only if you get relevant traffic. Bursts in the traffic curve mostly occur when your blog traffic is irrelevant. There is yet another segment of bloggers who measure the success in terms of number of hours a blogger spends online. The only advantage of your online presence is that you’re available to respond or approve comments and to repair broken or wrecked links on your site in no time. You must also spend your online time on researching and coming up with useful information to share and then packing that information in a form (say a blog post, an audio, a video post, a report etc.) so it can be of help to your readers. And this is the most important bit ever! Read below. Content is king – content for more blog traffic? This is well known and well established. No doubt about it. I mean, content is the backbone of whatever business you’re going to do (or doing) online. You sell, convince, attract, capture attention, market, make relationships, establish expertise – all through your blog content. But your content should reach the relevant audience or it will have much less value; no matter how top quality your content is. So your targeted blog traffic plays the role of making your King, King. Your ultimate aim is therefore to put your content out there before targeted and relevant audience so that it gets the right recognition, treatment and exposure. Check out my content creation course to create great content for your business. While there are many ways to generate blog traffic, it is essential to concentrate on core competency where you can do the maximum justice. You can promote blogs through blogging communities like DoSplash, social networking sites, social bookmarking sites, blog commenting, forum commenting, guest blogging, etc. However, you should have a keen eye to gauge the success channel and it is advisable to spend more time and effort in that area. For example, if you are able to get tangible traffic figures through guest blogging, you should indeed be doing more of it. But always keep the other methods by hand. Don’t rely merely on one or two techniques. Tap all the possibilities to gain optimal results. At the same time, don’t stretch yourself too thin! Will a mention from a big shot blogger help? This is one of the main concerns of many bloggers: “I am unable to get their attention so that they will link to be, tweet about me or mention me anywhere!”. It is true that mentions from A-list bloggers can trigger a new wave of blog traffic. But, the key to this happening is with you. If you are not able to offer quality content that is worth talking about, then not only A-listers, in fact no one will mention your content. Even if some A-Lister mentions you out of pure courtesy or friend-sake, you will not be able to retain the new blog traffic generated in this manner. You should analzye the volume of your blog traffic by also keeping your blog’s age in mind. If your blog is quite new and if you’re comparing your blog traffic stats with that of another big-shot blogger who has been blogging for 10 years, it is just waste of time. Your ability to offer innovative and thought provoking content will bring more blog traffic than you think your time spent online will bring. Content aligned with your audience’s needs brings more blog traffic. In other words, if you deliver what is expected from you by your audience or what is most wanted in the market, then you will get consistent and sticky blog traffic. Focus on the blog promotion tactics (as per your core competency) where you can get back more. Instead of spending all day looking at your stats you actually need to do something about it! What are your thoughts about the myths and misconceptions about blog traffic and the related stats? Just looking at your stats and twiddling your thumbs hoping that a great burst of traffic will come won’t do anyone justice. This is coming from experience. I use to write blog posts that weren’t great in value, share them in the same places and never progress beyond a certain threshold. If you’re going to view your stats then make use of them. Step up your content and figure out where most of your traffic is coming from. Once you take action then you’ll get better results . Yes – twiddling your thumbs is certainly not enough. I was once like that – so much obsessed with the numbers, and watching them all the time. I am sure every blogger has this “phase” in their starting period lol!